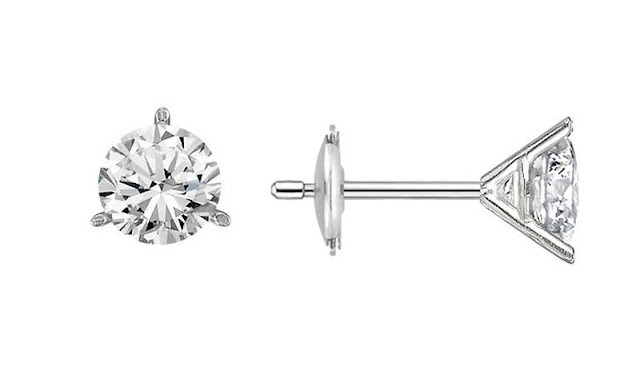 Diamond stud earrings are probably the most versatile accessory you can own. Unlike diamond hoop earrings or other dangling earrings, studs offer a conservative design that lets the gemstones do the talking. Whether dressed up or down, diamond stud earrings are the perfect way to complement your style and add luxury to your look. 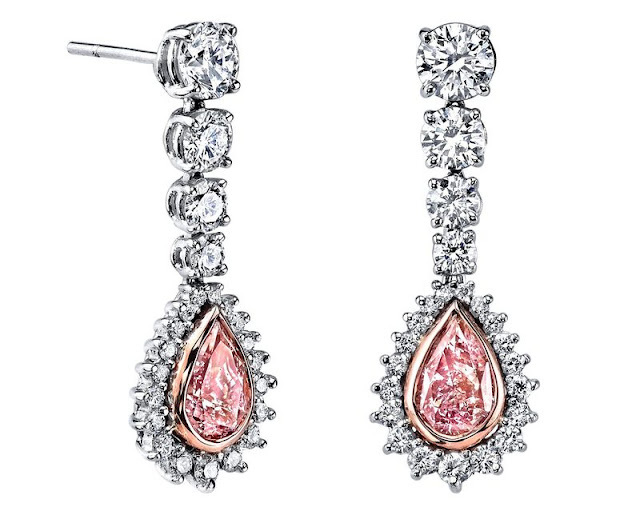 When shopping for diamonds earrings, it's important to keep your style, budget, and wardrobe in mind to help you find the most complementary pair. 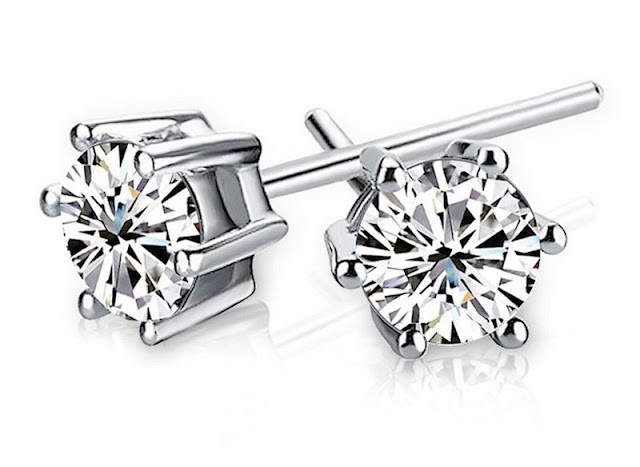 Check out these tips on how to choose diamond stud earrings to find your perfect match. Establishing a budget is an important first step when shopping for diamond earrings. A budget will ultimately determine the quality, size, and metal of the jewelry you choose. 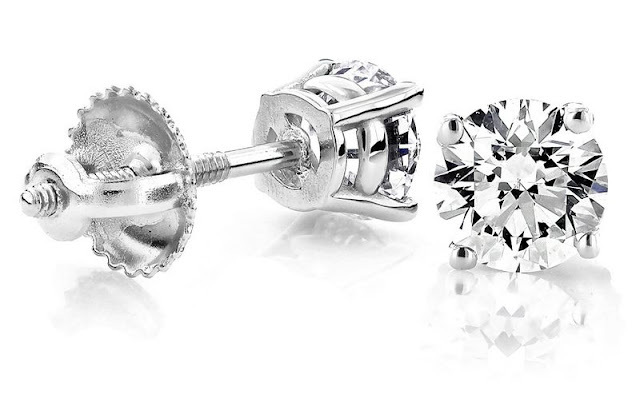 Prices for quality diamond stud earrings can range anywhere from $150 to over $25,000 per pair. So, begin your online shopping by first filtering by price to ensure you're staying within your desired budget. Carat weight is good indicator of price - larger carat weights typically indicate a larger price tag. The cut of a stone can be another factor when it comes to price, as it can sometimes make the stone appear larger than the carat weight may indicate, making cuts like marquise and princess a potentially better value. Carat weight refers to the actual metric weight of a gemstone. The larger the carat, the more rare and expensive the stone. 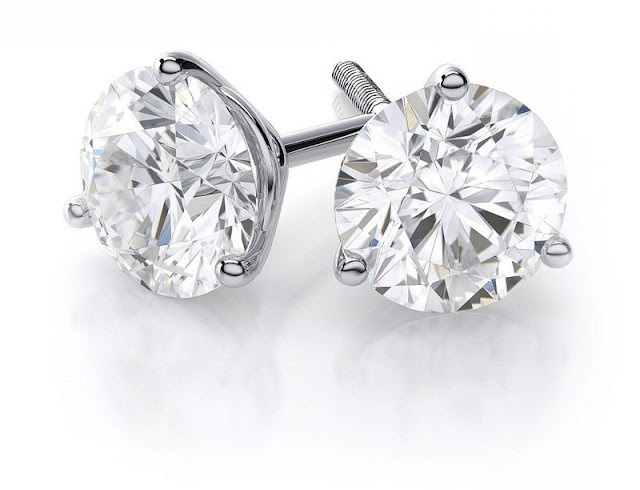 Diamond studs typically feature stones that range from 0.1 carats to 2.5 carats, though some high-end brands may offer carat weights above four. Aside from the budget, you may decide to opt for a smaller carat weight if you have sensitive ear lobes or are purchasing diamond stud earrings for a child. Diamonds come in a variety of hues, including black, yellows, blues, and pinks. Colorless diamonds are the purest and often the most expensive. 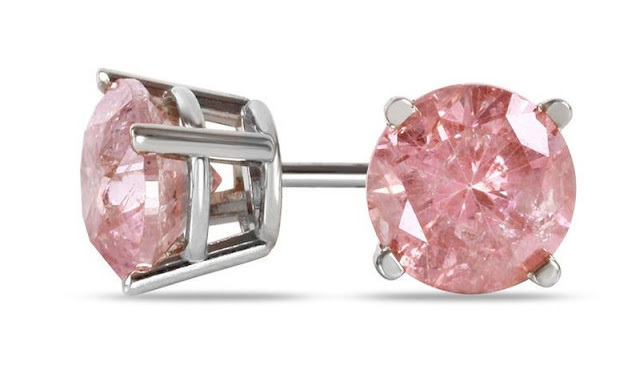 Flaws like inclusions or discoloration typically reduce the price of diamond stud earrings, which is beneficial if you prefer the unique, edgy look of colored diamonds. Clarity refers to the condition of a gemstone, and letter grades are given to stones on a scale from flawless (FL) to Included (I). If you’re looking for beautiful diamonds that look perfect to the naked eye but have hidden flaws, opt for budget-friendly studs with an I1 or I2 clarity rating. The signature sparkle of a diamond is created by the cuts and faceting of the stone, which allows it to catch and refract light. Gemstone cuts are graded on a scale from "Excellent" to "Poor" depending on the amount of light that is refracted. For diamond studs, finding the right cut depends on the size and amount of sparkle you are looking for. Diamonds cut with a larger surface area, like the marquise or princess cut, tend to appear larger than their carat weight may imply. Round- and brilliant-cut diamonds offer maximum sparkle thanks to their angled facets around the crown. 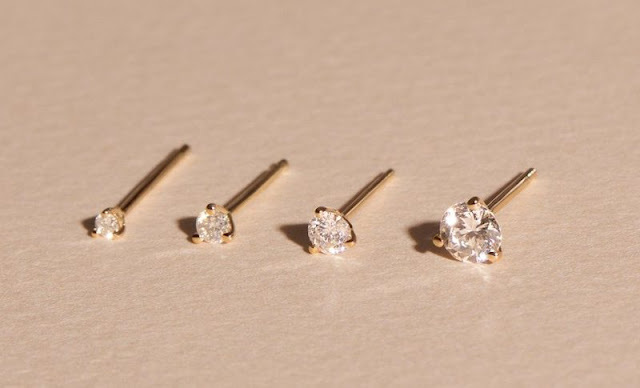 The setting is an important part of choosing diamond stud earrings. 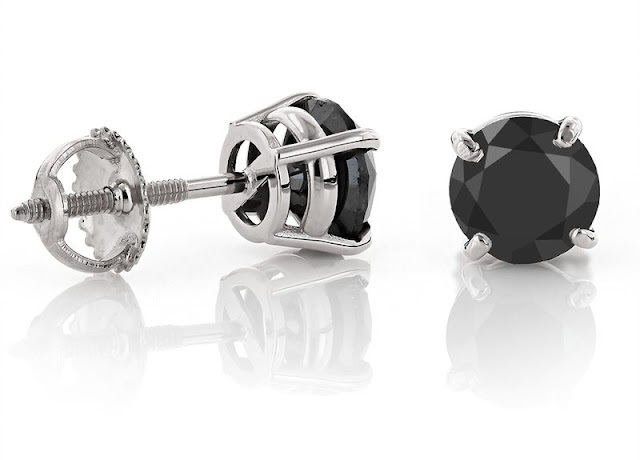 Diamond studs for men and women feature bases made from precious metals such as 14K / 18K gold, platinum, and sterling silver. 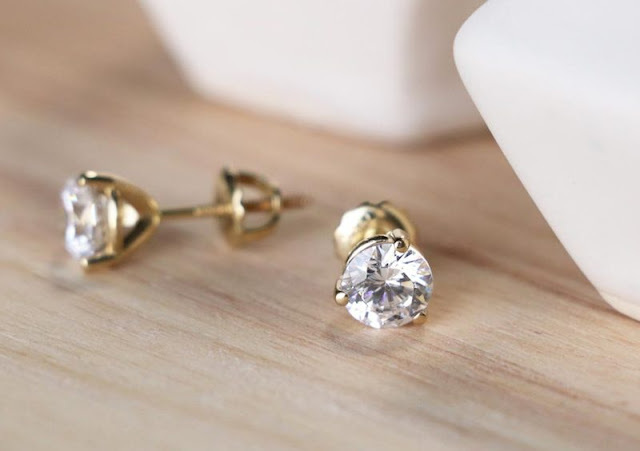 There are even varying shades of gold, such as yellow gold, white gold, and rose gold, which help impart a unique look to earring settings. 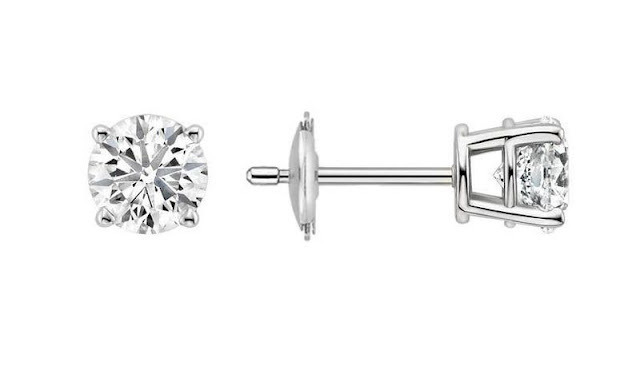 Setting styles for studs typically include prong and bezel settings. Prong settings generally have between three and eight prongs that hold each diamond close to the earring and offer the maximum amount of light to pass through the stone creating more sparkle. Bezel settings form a complete rim around the edge of the stone and are one of the most secure setting types for precious stones. Select a metal for the settings. Gold and white gold are popular settings and stand out against darker skin and hair. Silver and platinum settings pair well with lighter skin tones and hair colors. Try on the earrings and compare them to your features so you find the one that looks best on you. If you’re allergic to nickel, look out for the gold settings. Some may have this metal in them, so it’s best to ask the salesperson. Select platinum for durability. White gold is actually harder than platinum. Though white gold resists scratches better, any scratches it obtains are permanent. Scratches on platinum cause a patina to form, which can be reversed by polishing, making platinum the winner in terms of durability. However, platinum is heavier and more expensive, so factor that in when making a decision. White gold is mixed with another metal which makes it harder than yellow gold. Sterling silver, while inexpensive, is as easy to scratch as pure gold and is prone to tarnishing. Like white gold, silver is often mixed with another metal to make it a little stronger. 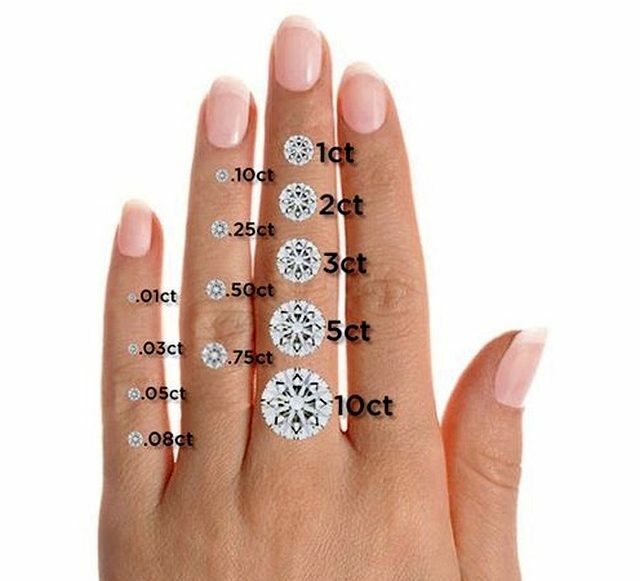 Pick smaller settings to make diamonds more visible. Metal settings also come in many different styles. The most common style is prongs, which are basically little metal arms that hold the diamond in place. Prongs generally reveal more of the diamond than bezel settings. Settings with more prongs provide more security, but those with fewer prongs show off the diamond better. In addition to prongs, there are martini-style and basket-style settings that show off the diamond without full support. Choose larger settings for diamond security. Bezels are the other common setting type. The metal surrounds the edge of the diamond, keeping it secure. The drawback is that the metal covers more of the diamond, so that expensive beauty you purchased might be hidden behind a less appealing chunk of metal. The crown-style setting is similar but more ornate because it is shaped like a crown. Select push backs for ease of use. All that’s left for you to do is find a way to hold your studs in your ears. Push backs are the most popular choice for this. Push them into your earlobes and you’ll be ready for a night out. They’re simple and easy on sensitive skin. Pick clip or lever backs for comfort and security. These backs have small bars that secure the earring behind your ear. They’re much safer than push backs for pieces you don’t want to lose. Clips can pinch your skin, causing pain when you keep the earrings in too long. Lever backs are flatter and typically more comfortable than clips. Get screw backs for the most security. Screw backs are far more difficult to get in and that’s why they can hurt your poor earlobes. The backings are thick and require effort to get into place. If your ears can handle it, the extra security is valuable for saving your new earrings.